The study of the Tree of Life is one of the most hallowed and important facets of Jewish mysticism. The allure of “climbing” the tree, of learning more and more and eventually ascending into another form, is so enticing, that the study of this branch of Kabbalah is for the most part only allowed to be undertaken by married men over the age of forty. Such is the danger of losing oneself to the beautiful dream. 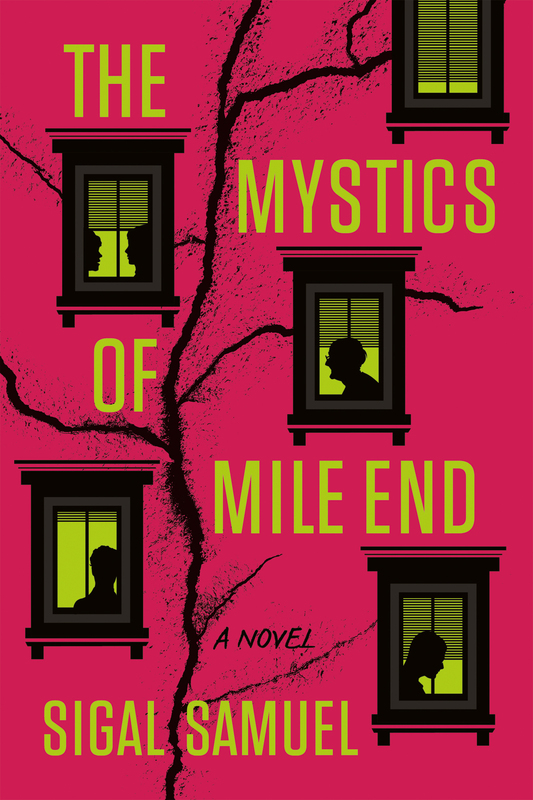 Sigal Samuel’s debut novel, The Mystics of Mile End, follows the fortunes of the Meyer family of the eponymous Montreal district. When his wife dies after being hit by a car, professor of Jewish mysticism David Meyer turns almost completely inward, and his actions and thoughts become constant sources of anxiety and anguish for his two children, Lev and Samara. Adding to this family chaos is the forbidden study of the Tree of Life, which effects each of the Meyer clan in its own way, leading the younger child Lev into a life of Hasidic isolation, David into confronting his faith, long left shattered after his wife’s untimely demise, and Samara into, well, you’ll have to read to find out. The setting of Mile End is interesting, and somewhat unique in the current CanLit scene, which feels awash in Atlantic province miserablism, Prairie province family sagas, and northern territory survival stories. Mile End wears the culture clash at the heart of the novel as a badge of honour, with cloistered Hasidic Jewish inhabitants often brushing up against over-caffeinated hipsters on fixie bicycles. We spend most of our time learning about the area in Lev’s opening segment of the novel, which is told in his charming, eager-to-please voice, somewhat reminiscent of Ava Bigtree from Karen Russell’s Swamplandia! or Gray from Corinna Chong’s Belinda’s Rings. Lev even takes up with one of the more colourful denizens of Mile End, local weirdo Katz, whose doomed attempts at his own versions of the Tree provide a sense of there but for the grace of God goeth the rest of the cast. Lev also becomes friends with a local boy named Alex, whose ultra-rationalism in the face of all the mysticism is a useful tonic for non-believers. My favourite part of the book belongs to Samara, who is a bit of a cipher for the prior two segments. It is through her eyes that the true cost of subsuming one’s being into the pursuit of knowledge, into ego death and transcendence, entails for those of us stuck back in the mortal plain. The writing recalls both Henry Roth and Philip Roth in this regard, as the religious awakening undergone by Samara echoes the former’s Call It Sleep, and the vulgar state of her corporeal remains resembles that of the wayward daughter from the latter’s American Pastoral. In Sigal Samuel’s hands, one should count themselves lucky to not encounter the mysteries of Kabbalah, as they seem to invade the body like a disease leaving only brokenness in their wake. There are a few writerly tics that mark this off as a first novel, with all that entails. Samuel, to my mind, relies a little bit too much on lists and emails written by her characters, and a few of the late-game revelations seem a bit too pat, especially those involving a family friend. Still, for a first novel, The Mystics of Mile End is exceptionally crafted and a fascinating look into a place and people sorely under-represented in the current Canadian literary scene. Highly recommended for anyone interested in modern-day Montreal life, the conflict between religion and science, or families undergoing strain. Full disclosure: I received a copy of the book in exchange for an honest review. Also, I work at the press that published Belinda’s Rings.